Synology DS411 delivers an average 105.3 MB/sec reading speed under RAID 5 configuration in a Windows environment, and 47.8 MB/sec writing. Synology DS411 provides a reliable solution for data sharing with an easy to use interface, and comprehensive office applications, including a complete backup solution making it one of the best values in 4-bay NAS devices available today. SKU: DS411-12TBR Category: Small Business 4 Bay NAS Servers. Synology DS411 offers comprehensive network protocol support, assuring seamless file sharing across Windows, Mac, and Linux platforms. Windows ADS integration allows the Synology DS411 to quickly and easily fit into an existing business network environment with no need to recreate user accounts on the Synology DS411. Internet file access is simplified by the encrypted FTP server and the web-based file explorer, Synology File Station. HTTPS, firewall, and IP auto-block support ensure file sharing over the Internet is protected at a high security level. For users who are always on the move, Synology provides a handy app, DS file for the users of iPhone, iPad and Android phones. Anything stored on Synology DS411 can now be accessed remotely using DS file via the Internet. 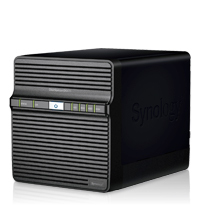 Synology DS411 offers a centralized backup target to consolidate fragmented and unstructured data across a network. PC users can back up their data to Synology DS411 using Synology Data Replicator software, and Mac OS X users enjoy native Apple® Time Machine integration. A web-based backup wizard is provided for backing up data in Synology DS411 to another Synology DiskStation or any rsync server via an encrypted protocol, or to an external hard drive via USB connection. In addition, backing up to the cloud using Amazon® S3 service is supported. The add-on package, Time Backup, keeps DiskStation data in multiple versions, so IT administrators could easily keep track of them and restore to previous version whenever required. Synology DiskStation DS411 runs on the award-winning operating system, Synology DiskStation Manager (DSM), offering comprehensive applications and features designed specifically for home and business workgroups. SynologyWeb Station with support for PHP/MySQL web content allows hosting up to 30 websites, and 3rd party web application such as Content Management, Customer Relationship Management & e-Commerce system. Synology Surveillance Station offers a centralized interface to safeguard the office environments by deploying IP cameras, and users traveling miles away are able to see the live view, recordings and take snapshots using a browser on any computer or an iPhone with DS cam app. The built-in mail server turns a Synology DS411 into a dedicated mail service provider and the USB printer sharing capability minimizes businesses’ printing cost by sharing printing resources throughout the office. The add-on package, Mail Station 2, provides a webmail interface for users to access the email stored on Synology DS411. Synology DiskStation are designed and developed with energy efficiency in mind. Compared with the average PC counterparts, Synology DS411 consumes only 29.7 watts in operation. The support of wake on LAN, scheduled power on/off and hard drive hibernation can further reduce power consumption and operation cost.